Wether or not being gay is a sin is completely irrelevant! We could debate all day whether or not being gay is a sin. Whether or not it is a sin does not justify why many Christians treat those who identify as LGBT like they are evil-doers deserving of Hell! Many Christians are hypocritically treating these folks in very unloving ways: from fighting against gay marriage to banning LGBT folks from taking leadership positions within their church or even firing them from a job they are Divinely called to do! Before you begin to formulate your debate to justify these actions: read on and consider what I am about to say. Everybody sins. Everyone. We have preachers preaching and people marrying everyday who are active sinners but do we actively take away their rights or keep them from their Divine calling or even give them a second thought? No! For the record, I don’t believe (Biblically speaking) that being LGBT is a sin… but, I DO believe there are many other behavioral sins that many Christians are guilty of every single day. For example: being a glutton is a sin. Admittedly, I am guilty of it. Yet, I was able to marry in a church, by MY pastor! I teach Sunday School and am part of a leadership group within my church! No one seems to care one bit about the fact I carry extra weight or buy too many pairs of shoes. Even with this proof of my transgressions I am accepted as I am and valued for my heart, faith and belief in our One Loving Living God! I wonder what life might be like if we started judging ALL behavioral sins in the same way? All overweight pastors would be forced to get a medical release to prove they are not overweight due to gluttony! They would be forced to live on a glutton-free diet or risk being defrocked! Insane thought isn’t it? Yet we do something similar when we believe being LGBT is a sin and we criticize, judge and withhold equal rights from those we are called to love because of that belief. Question is: why do we in the Christian Faith treat the “sin” of living/being gay so much differently than other behavioral sins? Answer this and perhaps I can understand how those who believe being gay is a sin justify treating these LGBT accused “sinners” differently than other sinners… and different from ourselves. James 4:11-12 (GNT)Do not criticize one another, my friends. If you criticize or judge another Christian, you criticize and judge the Law. If you judge the Law, then you are no longer one who obeys the Law, but one who judges it. God is the only lawgiver and judge. He alone can save and destroy. Who do you think you are, to judge someone else? 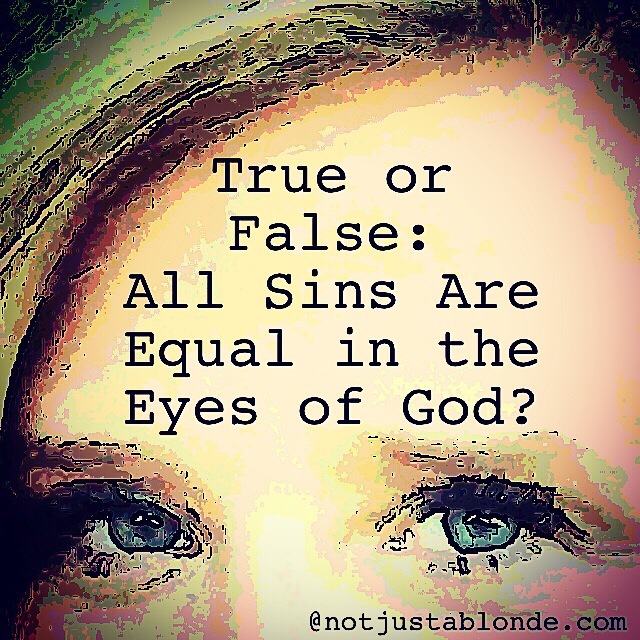 I actually don’t agree that all sins are equal in God’s eyes (or at least I don’t think they are) because Jesus said that the Pharisees – who were famous for they hypocritical judging of those trying to live their lives to please Father – were facing a worse damnation. He said the towns where folks witnessed His great works of love and mercy – His miracles – were worse of than – of all places – SODOM. so the simple church folks of Bethsaida who rejected Christ were more guilty that those of the most famous center of homosexuality of all time. Good word – though a little hard to hear – Thank you! I too don’t totally believe all sins are equal! yet I don’t think the severity of sin matters in the way most might. I believe sin distances us from God. I believe some sins distances us from Him more than others. Also, some have greater Earthly consequences! Having said that, I believe many sins have more or less a similar distancing effect… lifestyle choices such as over-consumption and inappropriate sexual involvement being examples of such. Again, I don’t believe being LGBT is a sin, but if it WAS then I believe many of the Christians who judge them are JUST as sinful as those they judge. They are hypocrites! Marie, I do believe that some sins are worse from our perspective here in Earth as there is no debate on the tragedy and earthy pain of murder and abuse. That’s why I decided to derive the analogy between homosexual “sin” and another behavioral sin widely committed, that of gluttony (over consumption). I’m guilty of from time to time judging other’s sins as worse than my own so in that way I’m no better. The worst part of this type hypocrisy is that those who are judging homosexuality are using this judgement as justification to treat others poorly and deny them the same opportunities and rights that other equally sinful folks have. That’s not Christian! That’s not loving! It appears more like bigotry and hate. I agree that sin essentially is any behavior that is not in align with God. I have to comment on two ideas of this post. The first is prompted by a report in today’s newspaper, in which Richard Dawkins is said to have caused an uproar on Twitter, by posting: Mild pedophilia is bad, violent pedophilia is worse. If you think that’s an endorsement of pedophilia, go away and learn how to think. His problem was not that he was in any way endorsing pedophilia, but that he used the term ‘mild,’ because those people who had been a victim of pedophilia knew how much it had made them suffer. However, on the basis that my definition of sin is doing something that you know might cause someone else to suffer, then it could be argued that being a victim of pedophilia and violence causes a child to suffer more than pedophilia alone. Obviously there is a wide spectrum of offences under each category, so there would be an overlap, but for a given offence of pedophilia, to add to it violence will surely add to the suffering, therefore the two together would be worse. The second point is that, if we believe that Jesus is the Son of God, we are responsible to God for our own conduct. In my first church, we had six leaders, and one of them told me that once a week they held a meeting at which each was asked by the others if they had sinned since they last met. Presumably they were required to confess this sin to God, if they knew of one. This process didn’t seem right to me, because there are scriptures that show that we are each responsible to God for our own sins. I do not know where they got this practice from, but it seems rather Catholic to me. The bible is simply man’s attempt to comprehend the incomprehensible. But the whole idea of one sin being worse than another is part of what drove me from the church and from Christianity. For a group of people who proclaim marriage to be a sacred rite, there sure are a lot of Christians who divorce, breaking their sacred vows. BKF, Hypocrisy is rampant in today’s fundamentalist churches! You are far from alone in feeling like you want no part of that. ← Appearances Don’t Matter… It’s All About Your Heart!